Can you think of a better way to welcome spring than driving all over Halifax in search of the perfect burger? Neither could we, so that's just what we decided to do. There were quite a few reasons we decided to start our company in Halifax. If we had have known about Halifax Burger Week this time last year, it would have made our decision that much easier! Halifax Burger Week is a great way to get out and enjoy the city - even if the weather is still on the unpredictable side and there may not be a single green blade of grass in the entire province. If anything is going to motivate us to get on the move it would be 125 of the best burgers this city has to offer. But where to begin? We consulted with our in-house burger experts and came up with a list of top prospects for burger of the year. Be sure to check back during the week since we'll be updating this post daily to keep you current on all the deliciousness we encounter on our burger-inspired adventure. It wouldn't be in true Clutch spirit if we didn't give back along the way. That's why we're giving away gift cards to every restaurant we feature, and matching that with an equal donation to Feed Nova Scotia. Head to our Facebook page to enter the contest and support a great cause! VISIT OUR FACEBOOK PAGE TO SEE HOW YOU CAN WIN A $25 GIFT CARD FOR THE PEANUT BUTTER BURGER FOR YOU AND YOUR FRIENDS!!! Darrell’s has long been a favourite of mine. The staff is very kind, the loyalty and care given to each customer is obvious, and they maintain a warm and friendly environment. We expected a long wait upon arriving but they accommodated the line quickly and even provided a tented area. Burger lovers can line up and stay warm anticipating that delicious peanut butter experience! Visiting a different area of Halifax and seeing the same hospitality everywhere I go makes me feel grateful to be a part of such a wonderful city. It was my turn to choose a burger and I went with the best of the best. The Peanut Butter Burger. A lot of the burger week burgers have some pretty "out there" ingredients but Darrell's keeps things simple with one special ingredient that makes every bite feel like you are biting into a cloud – Peanut Butter. It's such a good deal, being on the $6 burger list with tons of cheese and bacon. This burger was stimulating and each bite tastes different, some succulent and some sweet–full of everlasting peanut butter. I highly recommend. Darrell's has won some serious awards for this burger and it shows! The burger in many ways was fulfilling. I advise you to get out and brave the line. Especially since we wave goodbye to the cold days here in Halifax. Burger Week is a great way to welcome in spring! Love to explore. Whether it’s riding a new trail on my mountain bike, trying different foods, or reading a new book, that sense of discovery can become addictive. Burger Week is no exception. With so many restaurants with different burgers there is plenty of exploring to do. I wanted to try something unique, and after a bit of searching I found something that most definitely fit the bill: Mappatura’s calamari burger. The glass facade lets light flood in during the day and makes the restaurant seem to glow at night. I love to explore. Whether it’s riding a new trail on my mountain bike, trying different foods, or reading a new book, that sense of discovery can become addictive. Burger Week is no exception. With so many restaurants with different burgers there is plenty of exploring to do. I wanted to try something unique, and after a bit of searching I found something that most definitely fit the bill: Mappatura’s calamari burger. 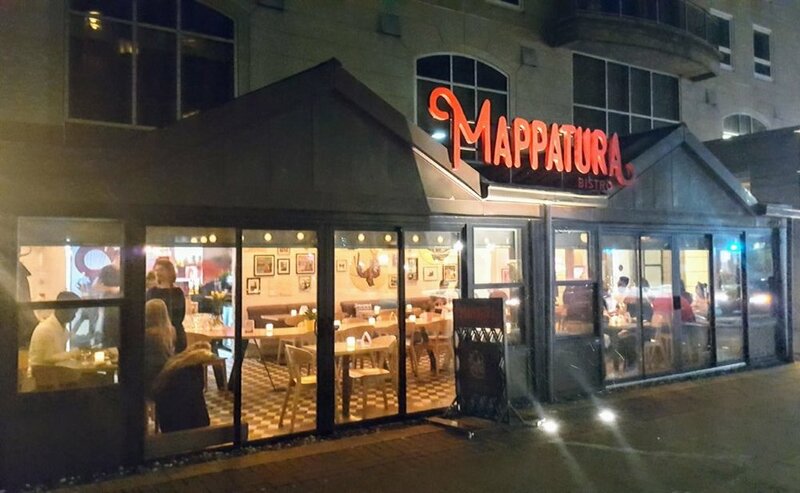 Mappatura means mapping in Italian; the perfect name for a restaurant built around the theme of exploration and with a flair for the creative. After getting a feel for the restaurant, it seemed only natural to see something as unconventional as a calamari burger come out of their kitchen. Taking a bite into the unknown. What makes a burger a burger anyway? I thought I had a good idea before, but after eating the Squid Pro Quo burger I have no idea. Despite having calamari as the main ingredient, I still felt like it should be considered a burger, but I’m not sure why. Perhaps it’s the combination of ingredients: fried calamari, spicy tomato sauce, black olives, winter slaw, beer and provolone fondue, all piled in between a milk bun. Definitions aside, it tasted delicious. So many flavours, none of which would normally be found on a burger. [caption id="attachment_455" align="aligncenter" width="840"] A combination of well-curated art, lights, and photos come together to give Mappatura its authentic atmosphere. After finishing my meal, I had a chat with the restaurant owner, Simone Mombourquette. She told me about the inspiration for the decor; maps of places she’s traveled, family photos, art made by one of her employees. All in all, an authentic feel that made me feel at home. One of Mappatura's staff posing beside their mural. The mural and associated branding were my favourite part, however. Floating 19th century divers, flying sailboats, all with a retro feel. So cool! The food and atmosphere were equally exquisite. I have to say, my desire to explore was certainly satisfied. If you want to take a bite of something truly unique, Mappatura Bistro’s Squid Pro Quo burger is a must! "You won't like me when I'm hangry." Clutch opened for business in Halifax this past fall, and previous to that, I hadn’t spent a lot of time on the East Coast. 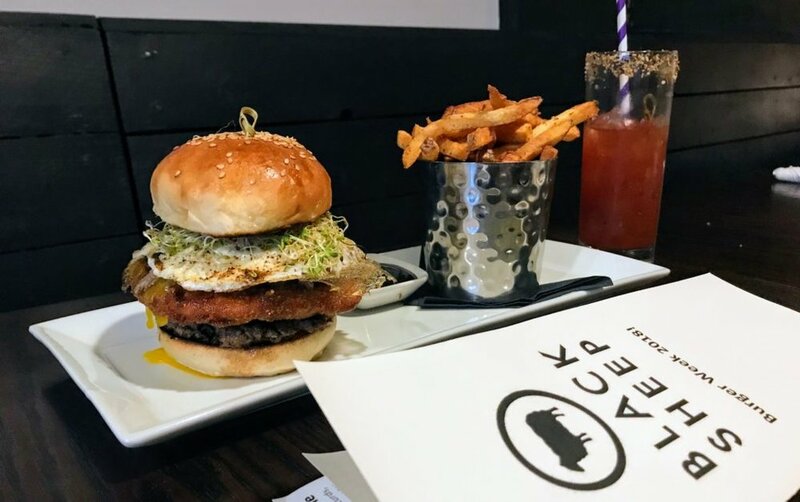 I love trying new types of food and discovering cool and unique restaurants – what better way to do both then Halifax Burger Week? Where do I begin? After endless scrolling and contemplation I narrowed down my selection and eventually decided to go with the burger from La Piazza Ristorante – an authentic wood oven pizzeria on Chebucto Road. As my friends and colleagues can attest, I don’t shy away from trying a new burger every now and then. After a busy week, I had a feeling that La Piazza’s aptly named Hulk Burger would satisfy my hunger. The fresh tomato, pancetta, and fontina cheese work equally well on pizza and burger alike. The addition of homemade coleslaw was an excellent complement to the hearty beef patty, and the fresh-cut home fries were piping hot – just the way I like them! After hulking out, our server introduced us to the restaurant’s owner and operator, Albert Zhouri. Charismatic, welcoming, and gracious, he was keen on showing us where La Piazza’s passion and skill truly lay – PIZZA! “Let me show you the oven!” Albert’s enthusiasm was easy to get behind, so to the oven we went. Within two minutes, a fresh, wood oven pizza was made from scratch before our eyes. A minute and a half later it was out of the oven and in a box, ready to go. “On the house,” he said with a smile. We had indulged a little too much at lunch; however, our coworkers were pleasantly surprised to see us return, goods in hand. You can tell that Albert’s success comes from his passion for people. As the co-founder of a young startup, this is something to which I can certainly relate. Although Clutch and La Piazza are in separate industries, there is still much to learn and appreciate from a well-run business like Albert’s. The ingredients of this work of art make it the Noah's Ark of the burger world. My choice for Burger Week was a little less of a challenge than my previous colleagues. The Black Sheep is one of my favourite local restaurants to sit down and enjoy an amazing brunch or dinner with friends. For me it was a no-brainer. Out of the half dozen times I have eaten there, I have yet to have a meal that disappointed in flavour or creativity. Located at 1569 Dresden Row, down a quaint alleyway, the atmosphere is cozy and welcoming to anyone that ventures inside. Everything is locally sourced and you can tell in the freshness of the plates offered. Their bartenders sure know how to mix a Caesar! The Black Sheep’s burger titled ‘The Whole Farm’ holds nothing back as far as toppings go; beef patty, braised lamb shoulder, fried goat cheese, duck confit, double-smoked bacon jam, over-easy egg, honey mustard, spicy mayo and sprouts, served on a house-made sesame bun. Honestly, the amount of toppings seemed to be almost too much when I was placing the order – while enjoying one of their delicious Caesars of course. However, my doubts were thoroughly eliminated when I saw the burger arrive and I took the first bite. Pat, our Regional Manager, taking a bite out of the Whole Farm. My taste buds were working overtime to accommodate all the amazing flavours and somehow it all worked together! You get sweet from the jam and mustard, salty from the meats and everything else in between. The Whole Farm was up there for one of the better burgers I have ever enjoyed. Not only was the burger great, but the staff and service was amazing, everyone was very accommodating and on their A game as always. Gallery and restaurant in one, the Black Sheep always has local art on exhibit. Black Sheep owner John House came out to greet us and made sure we felt welcome at the restaurant. He explained that all the amazing artwork for sale on the walls were on a monthly rotation, allowing customers to see something new all the time – what a great idea! If you’re trying to narrow down the 125 burgers to try this week, The Whole Farm at The Black Sheep is a must. I have been looking forward to visiting Antojo Tacos + Tequila since they opened their doors in January of this year. Naturally, Burger Week seemed like the perfect time for my first visit. Calaveras and vintage cerveza boxes add to the authentic atmosphere of the restaurant. Walking into Antojo, the atmosphere and decor were as authentic and inviting as the staff. Have you ever walked in somewhere and loved the place before you even sat down? That’s Antojo. Personally, my favourite part was the different representations of calavera strategically placed throughout the restaurant. They really put a lot of thought into the atmosphere and experience they want to promote and it shows. Complimentary appetizer of totopos and salsas to start things off. As you get settled in, you’re greeted with a basket of house-made tortilla chips called totopos and three different salsas made on-site. Honestly, my review would have been a glowing one had I just tasted those chips! The burger, oh the burger. The chorizo was obviously bursting with flavour and cooked perfectly. It was smothered in queso fundido (amazing) and habanero mayo on the side so that you can apply it to taste, be generous with it though as it adds a cool and creamy texture that really complements the chorizo. Did I mention that this burger comes topped with jalapeno rellenos? That is a grilled jalapeno pepper completely stuffed with cheese and wrapped. In. Bacon. Very Clutch! Restaurant manager Abhi pouring up an ice-cold cider. From the moment we arrived the restaurant manager Abhi Bawa and his staff were excellent! Even on a Wednesday afternoon the restaurant was in full swing – but you would never know it with the service we received. As I said, this was my first visit to Antojo but far from my last. Thanks to Abhi and his staff from us here at Clutch, see you soon. The staff at Barrington Steakhouse & Oyster Bar are top notch. The hospitality they provided while hosting our past events has been very professional and rewarding. When I'm not working at Clutch, I'm working with circus performers and perfecting my aerial and poi techniques so their circus-inspired Carnival Burger was the one for me. The spacious and welcoming main bar at the Barrington Steakhouse. When arriving at Barrington Steakhouse I was greeted by the General Manager, Mike Roberts, and he brought me on a tour of the restaurant (this was my first visit). The decor was beautiful, the paintings were my favourite type - abstract - and the iced display of oysters were mouth-watering. I was most in awe of the mason jars of house-made hot sauce hiding in the wine racks. It was the chef's special sauce with habanero and fresh pineapple. Trish admiring the mighty Carnival Burger before digging in! Okay, the burger. AH-MAZ-ING. If I had to choose between hotdogs and hamburgers, I'd go with a hotdog. This burger is the perfect little combo of both. It was dressed perfectly with the simple and nostalgic taste of ketchup and mustard, an onion ring, cheese AND chili, pickles, and a sesame seed bun. You would think this was too much but it actually worked really well and the construction of the burger stayed intact nicely. The Carnival Burger in all its glory. It comes with a side of your choice. I got the house fries with garlic aioli and balsamic reduction drizzle. This was an amazing burger and experience overall. The winner for our first burger week Clutch contest is going to be a lucky one!